Aston Martin has been a major player in the exclusive high-performance luxury car market for more than 85 years. Only 16,000 cars have ever been made bearing the Aston Martin name since the company began in 1914. The company is most recognized for its appearance in several James Bond films, it also has a rich history on the race car circuit, where its perhaps the only manufacture of English cars that can be considered the "thoroughbreds." 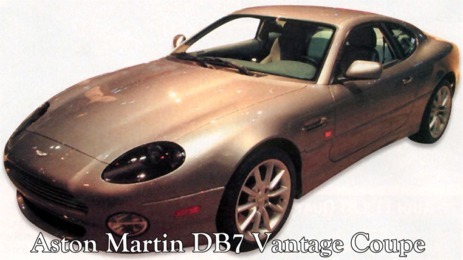 Aston Martin began selling this DB7, model in November 1994. Its style expresses a unique concept for an overall sports car by being equipped with a traditional radiator grille, giving the feeling of the good old days of famous cars, but in a 2+2-coupe model styling. The front-mounted powerplant is a 3239cc straight-6, 24-valve engine made by its sister company Jaguar, which combines with an Eton supercharger to give a truly powerful experience at a maximum power of 420 bhp and maximum torque of 400 lb-ft. Two transmission choices are offered, as a 5-speed manual and 4-speed automatic. Both the front and rear suspension are double wishbones, the standard in the sports car world. Ventilated disk brakes are used front and rear. With the supercharger, acceleration is smooth and powerful with no time lag, pushing hard to lug the huge 3,905-lb. body to reach its maximum speed of 184 mph. In addition, while maintaining this dynamic performance, its achieves a ride of an unsurpassed level of luxury. Such a luxury sports car would be unthinkable among Japanese cars. In 1996, they added to the lineup a convertible version of the model called the DB7 Volante. Both versions of the Vantage are extremely well balanced, and some of the sharpest looking cars in the game. Just because their luxurious doesn't mean they can't also perform well on the track.